The museum features 14,143 square meters of exhibit space for permanent collections and an additional 5,500 square meters for temporary exhibits. Near the entry to the museum is the Hall of Commanders, which features a decorative "Sword and Shield of Victory" and bronze busts of recipients of the Order of Victory, the highest military honor awarded by the Soviet Union. 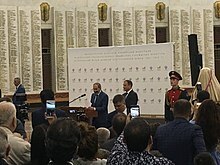 Nikol Pashinyan at the Museum. In the center of the museum is the Hall of Glory, a white marble room which features the names of over 11,800 of the recipients of the Hero of the Soviet Union distinction. A large bronze sculpture, the "Soldier of Victory," stands in the center of this hall. Below lies the Hall of Remembrance and Sorrow, which honors Soviet people who died in the war. This room is dimly lit and strings of glass beads hang from the ceiling, symbolizing tears shed for the dead. The upper floors feature numerous exhibits about the war, including dioramas depicting major battles, photographs of wartime activities, weapons and munitions, uniforms, awards, newsreels, letters from the battlefront, and model aircraft. In addition, the museum maintains an electronic "memory book" which attempts to record the name and fate of every Russian soldier who died in World War II. The museum is set in Victory Park, a 2,424-hectare park on Poklonnaya Hill. The park features a large, paved plaza, fountains, and open space where military vehicles, cannons, and other apparatus from World War II are displayed. Also in the park are the Holocaust Memorial Synagogue, the Church of St. George, the Moscow Memorial Mosque, a triumphal arch, an obelisk, and a number of sculptures. ^ a b c Museums of Russia (2009-03-20). "Central Museum of the Great Patriotic War of 1941-1945" (in Russian). Russian Cultural Heritage Network. Retrieved 2010-06-13. ^ "Memorial Synagogue at Poklonnaya Hill in English". Wikimedia Commons has media related to Central Museum of the Great Patriotic War. This page was last edited on 11 July 2018, at 21:42 (UTC).